My wife Noleen and myself are both qualified R.G.Ns and have managed Atlanta Nursing Home since march 1987. Since then we have totally upgraded and extended Atlanta house. We both play an active part in managing Atlanta and are more than pleased to say that 80% of our staff are with us since inception. We are always searching for ideas and ways to help improve our services and care offered to the residents and their families. The staff of Atlanta are continuously being kept informed about new nursing practices by our in house education programme. We are always upgrading our equipment to keep up to-date with the latest technology. 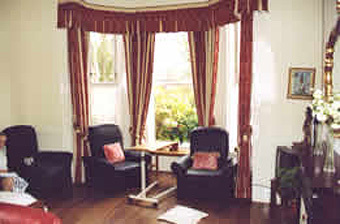 We are situated in the beautiful see-side town of Bray sea-front, main st and the Dart Station. Visitation by Drama Groups on occasions. 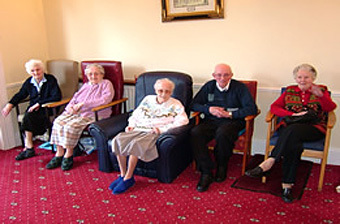 Atlanta House operates an open house policy where visitors are concerned. Visitors are seen as an essential part of daily life and are encouraged to join in with any of the activities including the popular birthday parties. Visitors are welcome to stay overnight; please confirm availability. Special arrangements are provided for family and friends of ill patients. A chiropodist visits on a regular basis or on request by individual residents. A qualified hairdresser visits on a weekly basis or on special ocassions. People of all religious denominations are welcome at Atlanta House their spiritual requirements are well catered for. The beautiful Oratory on the ground floor is a very popular spot with many of the residents and their visitors. Mass is celebrated every Sunday by a Holy Ghost Father from nearby Greystones. The Parish Priest is another most regular and welcome visitor. 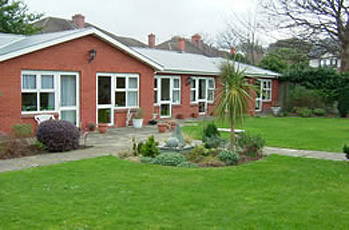 Church of Ireland services are said in the Oratory on request. 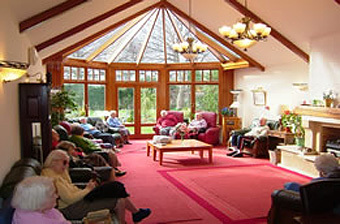 43 residents - 12 single rooms - 14 double rooms - 1 treble room - ensuite facilities - personal effects - TV points & phones in rooms - suitable for wheelchairs - lift to all floors - fire alarm - emergency lighting - nurse call facility - category of residents: long/short-term stay, geriatric, post-operative, convalescent, physically disabled, holday stay , terminal care. Atlanta House offers a wide range of facilities to ensure a residents every comfort, fully equipped bedrooms and a menu to suit every taste.